At the close of last week's report, we had just boarded the cruise ship Crown Princess in Skagway preparing to set sail to Glacier Bay, home to spectacular tidewater glaciers and a superabundance of wildlife. Of all the many majestic sights our party has viewed on this magical cruise, Glacier Bay stands out as most memorable. As we sailed up the deep and narrow glacial fjord, the snow-capped peaks of the Fairweather Range reaching 15,000 feet into the air loomed high in the distance, while bald eagles swooped over sapphire blue waters where harbor seals cavorted. A Park Ranger who came on board informed us that the ebb and flow of tidal waters in the bay can vary by as much as 25 feet from high tide to low tide. The bay itself was carved out over the past 100,000+ years by retreating glaciers such as the Margerie Glacier, known for dropping colossal chunks of ice into the sea, a process known as "calving" and, fortunately, a process we did get to witness first-hand. As spectacular as the scenery was to view, there was spectacular fun to be had on board ship as well. Just ask my granddaughters Olivia and Satomi. At age 10, Olivia joined a youth group known as the "Shockwaves" while Satomi, at age 14, joined a group known as "Remix." 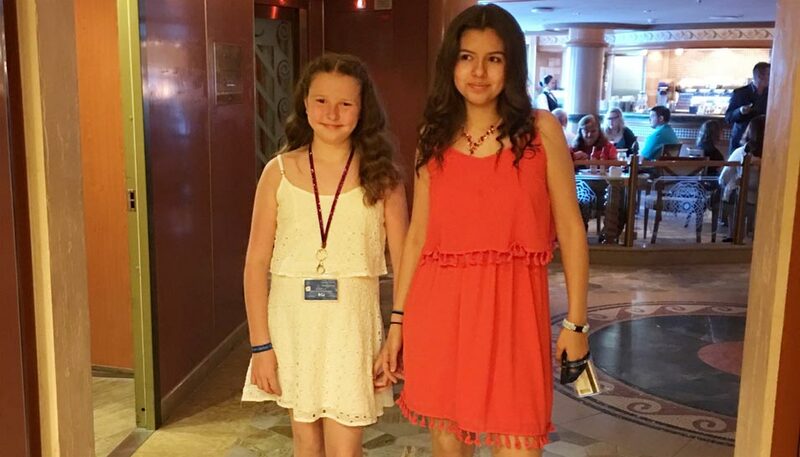 For much of the day and parts of the night, the two girls played games and watched movies and took part in a wide variety of fun activities with others their age while the two grandmothers pursued activities elsewhere on the ship. The four of us did manage to find time to be together as a group—usually for breakfast, lunch and dinner and for on-shore excursions and activities. What fun we all had. On our last day on the ground in Alaska before heading south for Victoria, BC, we spent half a day in Ketchikan, where Satomi, Olivia and I went zip-lining together. The three of us have long been fans of thrill-seeking adventures like riding on Space Mountain, Expedition Everest or one of the other roller coasters at Disneyworld. After zip-lining for the first time in an Alaska rain forest canopy, I can honestly say that this insanely fantastc sport can match any of those rides in terms of thrills and excitement. Being the seasoned adventurers that we are, we chose an adventurous zip-lining option, something called the "Rainforest Canopy Zipline" made up of 8 dual ziplines and a couple of tree ladders and propelling down on a rope pulley. None of us had zip-lined before, but thanks to the help of our experienced guides, by the time we had completed all 8 ziplines we were experts. As with so many other aspects of our Alaska cruise adventure, our only regret afterwards was we didn't have enough time to do it all over again, and again, and again. Our zip-lining adventures completed, we embarked on the Crown Princess for Victoria, BC, our final stop before returning to Seattle. The capital of British Columbia, Victoria is known for its picturesque old-world ambience. After a charming evening, we returned to the Crown Princess for our final leg at sea on our way back to the Port of Seattle. Three of us in our party of four call the State of Washington home while the fourth, Satomi, is about to set off for a new home in South Korea where her father/my son Brad Swayne—an Aramco brat—has just taken a new civilian job working for the U.S. Air Force. Given all that, we spent little time before our departure or after our arrival exploring the city of Seattle. For any of you readers who someday decide to take part in an Alaska cruise, I strongly recommend adding a few extra days to your trip so that you can enjoy some of the many splendors of what locals here like to call "the Emerald City." And, if you're looking for a cruise line to carry you to the far north and back, I highly recommend Princess Cruises. Email Aramcon John Sugg for great rates and expert help: [email protected].